The Hazmat Suit allows one to safely travel through irradiated zones, signified by Geiger counter style ticking. When the Suit is equipped, the wearer will be protected from most radioactive zones It does not provide full protection in certain areas, such as in the main building at the Launch Site, or the broken cooling tower at the Nuclear Power Plant. The main use of the Suit is to travel into irradiated zones, as its protective ability in combat is inferior to mid-tier equipment. However, in a pinch, it is better than being naked, unless one is trying to remain undetected as the bright yellow makes a person stand out against the landscape. The hazmat suit provides extremely good bullet protection in early game. 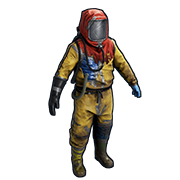 Be careful of wearing the hazmat suit all the time as it has a very distinct color and you will be more likely to be tracked by people. Do not research hazmat because its definitely not worth crafting.